Dark Matter should not to be confused with Dark Energy, Dark Fluid (is an alternative theory to both Dark Matter and Dark Energy and attempts to explain both phenomena in a single framework), or Dark Flow (astrophysical term describing a peculiar velocity of galaxy clusters). In astronomy and cosmology, dark matter is matter that is inferred to exist from gravitational effects on visible matter and background radiation, but is undetectable by emitted or scattered electromagnetic radiation. Its existence was hypothesized to account for discrepancies between measurements of the mass of galaxies, clusters of galaxies and the entire universe made through dynamical and general relativistic means, and measurements based on the mass of the visible "luminous" matter these objects contain: stars and the gas and dust of the interstellar and intergalactic medium. It is probably cold and if so, probably comprised of weakly interacting massive particles or many primordial intermediate mass black holes between 30 and 300,000 solar masses, or both. According to observations of structures larger than galaxies, as well as Big Bang cosmology interpreted under the Friedmann equations and the FLRW metric, dark matter accounts for 23% of the mass-energy density of the observable universe. In comparison, ordinary matter accounts for only 4.6% of the mass-energy density of the observable universe, with the remainder being attributable to dark energy. From these figures, dark matter constitutes 83% of the matter in the universe, while ordinary matter makes up only 17%. Dark matter was postulated by Fritz Zwicky in 1934 to account for evidence of "missing mass" in the orbital velocities of galaxies in clusters. Subsequently, other observations have indicated the presence of dark matter in the universe; these observations include the rotational speeds of galaxies, gravitational lensing of background objects by galaxy clusters such as the Bullet Cluster, and the temperature distribution of hot gas in galaxies and clusters of galaxies. Dark matter plays a central role in state-of-the-art modeling of structure formation and galaxy evolution, and has measurable effects on the anisotropies observed in the cosmic microwave background. All these lines of evidence suggest that galaxies, clusters of galaxies, and the universe as a whole contain far more matter than that which interacts with electromagnetic radiation. The largest part of dark matter, which does not interact with electromagnetic radiation, is not only "dark" but also, by definition, utterly transparent. Dark matter, it seems, has been clinging to galaxies for a very long time. Most galaxies that existed 10 billion years ago had about as much dark matter as galaxies do today, contradicting earlier studies that suggested less dark matter lurked around galaxies in the early universe. 2018 was a big year for dark matter. As usual, astronomers didn't actually find any of the stuff, which is invisible to all our telescopes but appears to make up at least 80 percent of the universe by mass. There were reports of a dark matter hurricane, but we can't actually see it. A galaxy was discovered that seemed not to have any dark matter, which oddly would have proved dark matter existed. But then it turned out that the galaxy may have dark matter after all - leaving the existence of dark matter in doubt for some physicists. Multiple experiments that were supposed to directly detect dark matter here on Earth turned up nothing. Scientists started watching crystals sparkle in the 1990s. Those crystals sparkled more in the summer, which researchers took as evidence of dark matter. But those scientists were probably wrong, new research suggests. Astronomers studying the motions of galaxies and the character of the cosmic microwave background radiation came to realize in the last century that most of the matter in the universe was not visible. About 84 percent of the matter in the cosmos is dark matter, much of it located in halos around galaxies. It was dubbed dark matter because it does not emit light, but it is also mysterious: it is not composed of atoms or their usual constituents like electrons and protons. Dark matter, the mysterious extra mass in the universe that emits no light yet exerts a gravitational pull, may actually be made up of primordial black holes that originated with the Big Bang. And these mini black holes can thank the Higgs boson for their birth - at least according to a new theory. This theory posits that these primeval black holes were created from instabilities in the field that gives rise to the Higgs Boson, the mysterious "God" particle discovered at the Large Hadron Collider (LHC). An unusually transparent galaxy about the size of the Milky Way is prompting new questions for astrophysicists. The object, with the catchy moniker of NGC1052-DF2, appears to contain no dark matter. If this turns out to be true, it may be the first galaxy of its kind - made up only of ordinary matter. Currently, dark matter is thought to be essential to the fabric of the Universe as we understand it. Astronomers have discovered that the brightest galaxies within galaxy clusters 'wobble' relative to the cluster's center of mass. This unexpected result is inconsistent with predictions made by the current standard model of dark matter. With further analysis it may provide insights into the nature of dark matter, perhaps even indicating that new physics is at work. Researchers have released the most accurate map ever produced of the dark matter in our Universe. The team surveyed more than 26 million galaxies in the largest study of its kind. The map will help scientists understand what dark matter is made from and learn more about another mysterious phenomenon called dark energy. 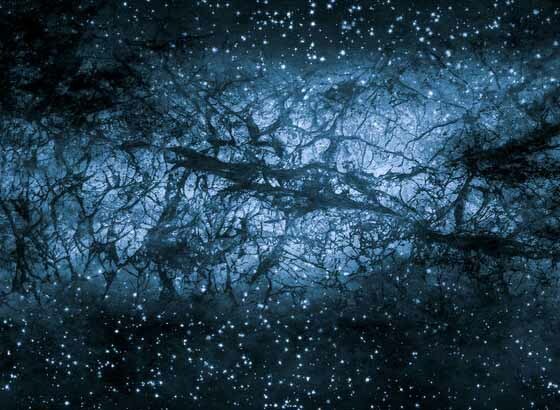 Scientists have never directly detected dark matter. But over decades, they have proposed a variety of theories about what type of material - from new particles to primordial black holes could comprise dark matter and explain its many effects on normal matter. An international team of cosmologists uses data from the intergalactic medium - the vast, largely empty space between galaxies to narrow down what dark matter could be. Despite being completely invisible to us and our instruments, the presence of dark matter can be detected through measuring its interactions with the observable universe such as its effects on gravitational waves and gravitational lensing. Several theoretical (but unobservable) particles such as axions and dark photons have been suggested as the means by which the dark sector might interact with the particles of our sector, but the exact mechanism for this interaction has remained unexplainable. One of the highest-resolution maps of dark matter ever created has now been revealed, offering a detailed case for the existence of cold dark matter -- sluggish particles that comprise the bulk of matter in the universe. Scientists believe dark matter -- theorized, unseen particles that neither reflect nor absorb light, but are able to exert gravity -- may comprise 80% of the matter in the universe. Dark matter may explain the very nature of how galaxies form and how the universe is structured. Experiments at Yale and elsewhere are attempting to identify the dark matter particle; the leading candidates include axions and neutralinos. Statistical analysis of mini-spiral galaxies shows an unexpected interaction between dark matter and ordinary matter. According to the SISSA study where the relationship is obvious and cannot be explained in a trivial way within the context of the Standard Model, these objects may serve as "portals" to a completely new form of Physics which can explain phenomena like matter and dark energy. They resemble a spiral galaxy like ours, only ten thousand times smaller. The detection was made by the Ligo (Laser Interferometer Gravitational-Wave Observatory) Scientific Collaboration (LSC) and Virgo collaboration on 26 December last year, just three months after the first gravitational wave was detected by the same group. Known as the 'Boxing Day event', the newly detected gravitational wave came about from the merging of two black holes over a billion years ago. The gravitational waves of the Boxing Day signal were produced by a pair of black holes, of around 14 and 8 solar masses, that travelled for over a billion years before reaching Earth. 'Einstein gave us a Christmas present!' said a spokesman from the American Astronomical Society. When an astronomical observatory detected two black holes colliding in deep space, scientists celebrated confirmation of Einstein's prediction of gravitational waves. A team of astrophysicists wondered something else: Had the experiment found the "dark matter" that makes up most of the mass of the universe? Scientists have collected a second burst of gravitational waves sweeping through the Earth. The warping of space-time was sensed on Christmas Day in the US at the Advanced LIGO laboratories - the same facilities that made the historic first detection in September last year. Back then, the waves came from two huge coalescing black holes. This new set of waves, likewise, is ascribed to a black hole merger - but a smaller one. About 1.4 billion years ago, the universe gave scientists a Christmas present. Two black holes spiraled toward one another, approaching closer and closer until they finally collided. Ripples in spacetime spread from the collision at the speed of light until, for about a second on December 25, 2015 (if you were in the United States), the space holding the atoms that make you up buckled and then relaxed. Long before we had the atomic theory of matter, scientists knew the air was real, even though it was invisible. This was because we could see its action as the wind caressed the leaves in trees. Likewise we see the influence of another invisible force in the wider cosmos in the movement of stars within galaxies. But we don't yet know what this mysterious dark matter is made of. Now a new generation of detectors - including one we're building in a gold mine in Victoria - is giving us hope that we might finally shed some light on dark matter. Some models predict that whatever particle makes up dark matter is also its own antiparticle. This leads to the fascinating prediction that if two dark matter particles interact they annihilate into a shower of either exotic particles or radiation. Physicists suggest a new way to look for dark matter: They believe that dark matter particles annihilate into so-called dark radiation when they collide. If true, then we should be able to detect the signals from this radiation. The majority of the mass in the Universe remains unknown. Despite knowing very little about this dark matter, its overall abundance is precisely measured. In other words: Physicists know it is out there, but they have not yet detected it. Is dark energy hard to detect because it's hiding from us? According to a recent theory, hypothetical particles called chameleons vary in mass depending on nearby matter: in the vacuum of space, they have a small mass and large reach, pushing space apart. In the lab, surrounded by matter, they have a large mass and small reach, making them difficult to detect. A new experiment seeks to find chameleons by lessening the screening. The mysterious stuff known as dark matter just became less ghostly. It makes up 85% of the total matter in the cosmos and comprises some 27% of the known Universe. For the first time, the enigmatic quantity may have been caught interacting with other dark matter in a cluster 1.4 billion light-years away. Previous studies of colliding galaxy clusters have shown that dark matter barely interacts with anything. Astronomers believe they might have observed the first potential signs of dark matter interacting with a force other than gravity. An international team of scientists, led by researchers at Durham University, UK, made the discovery using the Hubble Space Telescope and the European Southern Observatory's Very Large Telescope to view the simultaneous collision of four distant galaxies at the centre of a galaxy cluster 1.3 billion light years away from Earth. By observing multiple collisions between huge clusters of galaxies, scientists have witnessed dark matter coasting straight through the turmoil. Dark matter is the mysterious, invisible stuff that makes up 85% of the matter in the cosmos - and these results rule out several theoretical models put forward to explain it. This is because it barely interacts with anything at all, including the dark matter in the oncoming galaxies. Dark matter is more difficult to "see" - but not impossible. Although it does not emit or absorb light, it does have gravity, and so it bends the path of light passing nearby. This warps our view of anything on the other side of it, in an effect called "gravitational lensing". Astronomers have studied how dark matter in clusters of galaxies behaves when the clusters collide. The results show that dark matter interacts with itself even less than previously thought, and narrows down the options for what this mysterious substance might be. Galaxies are often found in groups or clusters, the largest known aggregations of matter and dark matter. The Milky Way, for example, is a member of the "Local Group" of about three dozen galaxies, including the Andromeda Galaxy located about 2 million light-years away. Very large clusters can contain thousands of galaxies, all bound together by gravity. The closest large cluster of galaxies to us, the Virgo Cluster with about 2000 members, is about 50 million light-years away. Astronomers have perhaps their best lead to date about the nature of dark matter, the strange and invisible stuff that dominates the material universe. The quest to find the most mysterious particles in the Universe is entering a critical phase, scientists say. An experiment located in the bottom of a gold mine in South Dakota, US, could offer the best chance yet of detecting dark matter. Scientists believe this substance makes up more than a quarter of the cosmos, yet no-one has ever seen it directly. Early results from this detector, which is called LUX, confirmed it was the most powerful experiment of its kind. Ever wonder how the hot soup of subatomic particles that filled the early universe transformed into the ordinary matter of today's world? Nuclear physicists exploring this question can't exactly travel back 13.8 billion years to watch what really happened, but they can recreate matter at the extreme temperatures and densities that existed just after the Big Bang by smashing together ordinary atomic nuclei at the Relativistic Heavy Ion Collider (RHIC). A new study of gamma-ray light from the center of our galaxy makes the strongest case to date that some of this emission may arise from dark matter, an unknown substance making up most of the material universe. Using publicly available data from NASA's Fermi Gamma-ray Space Telescope, independent scientists at the Fermi National Accelerator Laboratory (Fermilab), the Harvard-Smithsonian Center for Astrophysics (CfA), the Massachusetts Institute of Technology (MIT) and the University of Chicago have developed new maps showing that the galactic center produces more high-energy gamma rays than can be explained by known sources and that this excess emission is consistent with some forms of dark matter. Billions of particles of invisible "dark matter" are probably flying through your body right now, passing through the spaces between your atoms without a trace. According to conventional thinking, these particles should be somewhat less abundant during the winter and should peak around June 1. But a new study suggests this calculation is way off; the real peak is actually at the beginning of March. Ever since astronomers realized that most of the matter in the universe is invisible, they have tried to sort out what that obscure stuff might be. But three decades of increasingly sophisticated searches have found no sign of dark matter, causing scientists to question some of their basic ideas about this elusive substance. Physicists still have no proof that dark matter exists at all, but the evidence for it is substantial. The movements of stars and galaxies can apparently be explained only if there is much more gravitating matter in the universe than the visible stuff of atoms and molecules. Attempts to correct the discrepancy by rewriting the rules of gravity in Einstein's general theory of relativity have repeatedly failed. 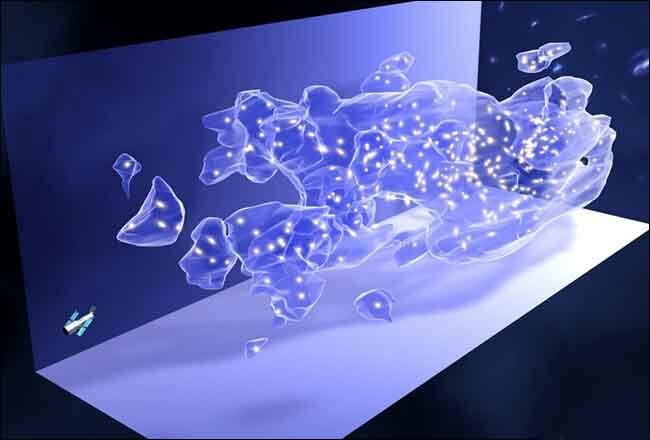 Dark matter is of course the mysterious stuff that physicists have come to believe exists all throughout the universe. We can't see it, but researchers have managed to sense its presence in a variety of ways (such as measuring its gravitational impact on stars, other planets, etc.). In so doing, most in the field have come to believe that it makes up approximately 80 percent of all matter. Unfortunately (mainly because it doesn't appear to absorb or emit light or electromagnetic radiation) none of the studies done so far have been able to prove that dark matter truly exists thus, the search goes on for some new kind of method to prove that dark matter isn't just a theory, or alternatively, for some other explanation of what has been observed.